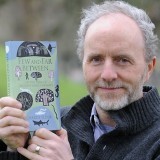 A regional daily journalist’s story of his hunt to find Great Britain’s rarest animals has been published in paperback. Charlie Elder’s Few and Far Between recounts his quest to find the UK’s scarcest and most endangered mammals, birds, fish, reptiles, amphibians and insects. On his travels, Charlie, who works as a production journalist for the Western Morning News, searched for elusive animals including the Scottish wildcat, spiny seahorse, wart-biter cricket, striking golden oriole and sinister black rat. A Guardian Book of the Year, it was published as a hardback by Bloomsbury last April and a paperback edition has now been released. His adventures include tales of close encounters with sharks, snakes, bats and bugs, and the book highlights the natural diversity on our doorstep in Britain and the plight of threatened species living on the brink. Charlie is also author of the book While Flocks Last, published by Penguin Random House, which describes his search for Britain’s most endangered birds.